One of the first things you’ll need to do to get ready for your first rehearsal is choose music. Figure out how many players you have (and how many octaves of bells you have at your disposal) and start going through your church’s bell music library. I usually start with 3-5 pieces to give us a few options. Look for pieces that will give everyone at least two bells plus any accidentals. This means that a piece might say it uses 25 bells, but a bell choir of 9-10 players could probably cover all the parts. Once you have some music picked out, spend some time studying the scores. Look up any new markings/techniques and practice them in advance so you can demonstrate them, if needed. Here is a helpful chart with handbell notation symbols and descriptions. A half hour before your rehearsal, set out the bells you will need* (like a piano keyboard, with the black keys set a little further back on the table), books with music (Rehearsal Tip: make sure the music is in the same order in every book), gloves, pencils, and highlighters (for those who wish to use them). *Note: Handbells sound one octave higher than they are written, which means C5 is Middle C in the music. If you have some new ringers, or it's been a while since everyone played, consider starting rehearsal with a review of rhythmic values. Treat these like "warm-ups." Write a few measures of rhythm up on the board or print something ahead of time that players can read from their books. Challenge them by having different people read different parts, or having them play in canon with each other. As you go, remind players about proper ringing technique (damping, ringing with a smooth, "scooping out” motion, etc.). Prepare the group for the music you plan to cover in rehearsal by taking a moment to introduce any new techniques and giving everyone a chance to practice them a bit. Talk about how these techniques are notated so they’ll recognize them when they see them. I tend to spend about 10-15 minutes on each piece. I usually begin by going over bell assignments (if it’s a new piece), reminding everyone about the sharps/flats in the key signature and any key or time signature changes ahead. We usually start by reading the piece all together so they get a sense of what it sounds and feels like. If they get lost partway through, I’ll try to get them back on track by calling out the measure numbers and counting the beats, but sometimes, we’ll stop and go back, working on one section for that particular rehearsal. Depending on the piece and the challenges it poses, we might practice in parts (low bells, high bells, melody only, bass line only, etc. ), practice in sections (e.g. mm. 1-32), and/or play under tempo. Once we’ve reviewed the piece in parts and/or sections, we put it back together again (though, this is not necessarily in the same rehearsal). Keep the beat with your right hand and use the left hand for expressive gestures or individual cues. If you choose to keep the beat with both hands, remember the beat patterns are mirror images of each other (e.g. the arms come in toward each other and go out away from each other on beats two and three of a 4-beat pattern). To begin, hold your right hand out in front of you, level with the floor. Your hand should be relaxed, slightly curved, fingers together. To give one beat of prep, lift your arm and hand up together and breathe in. To give two beats of prep, swing your arm and hand out to the right in a slight swoop motion, then up and over to the left, aligned with where your arm was resting. Try not to bob your wrist as you swing from beat to beat. Give a small, natural bounce with each beat and a swoop to the next beat, instead of moving in stiff, straight lines. Practice conducting different beat patterns (2, 3, 4, 6, etc.) so you’ll be comfortable conducting a piece that switches time signatures partway through. Plan out your rehearsal in advance and make note of any announcements or reminders you need to tell the group. Think about rehearsal order - what you’d like to start with, what you want to end with, and what would work well in the middle. Will you do any kind of warm-up activities? Do you have any new techniques to teach and practice? Build in time for this, if needed. This is one of those “best practices” for any and all rehearsals. If your bell choir is like most church bell choirs, you have a willing group of volunteers coming out for 45 minutes to an hour to play every week. Show your respect for them and their time by starting rehearsal on time every week, keeping track of time during rehearsal, and making sure you end on time. The best way to keep everyone engaged, challenged, and having fun is to keep things moving. Don’t spend too much time on one piece, especially if you start to sense that people are getting distracted and losing interest. If you choose to rehearse a piece in parts (low bells or high bells, say), make sure you only do this for a minute or two. Don’t leave the rest of the group hanging for too long. Mix it up by rehearsing some things from behind the bell tables and other things without music moving around your rehearsal space. Also, vary your rehearsal order so you have a faster, rhythmic piece followed by a slower, more lyrical piece, etc. If you have some players who are more experienced than others, give them an extra bell or two to play and teach them the 4-in-hand technique. You can also challenge your ringers by encouraging them to move around from piece to piece and play different bells. For someone who’s used to reading treble clef notes, have them try reading bass clef notes on one piece and vice versa. This is perhaps one of the most important parts of the job. Any facet of ministry requires you as the director to be a spiritual leader as well as a musical one. Inspire the players in your group to make music joyfully, as unto the Lord. Pray with them in rehearsal and remind them that the music they share is an important part of worship and pointing people to God. Talk about the pieces you’re playing and the meaning of the text behind the notes (you might consider printing the text in the bulletin when you play in church). 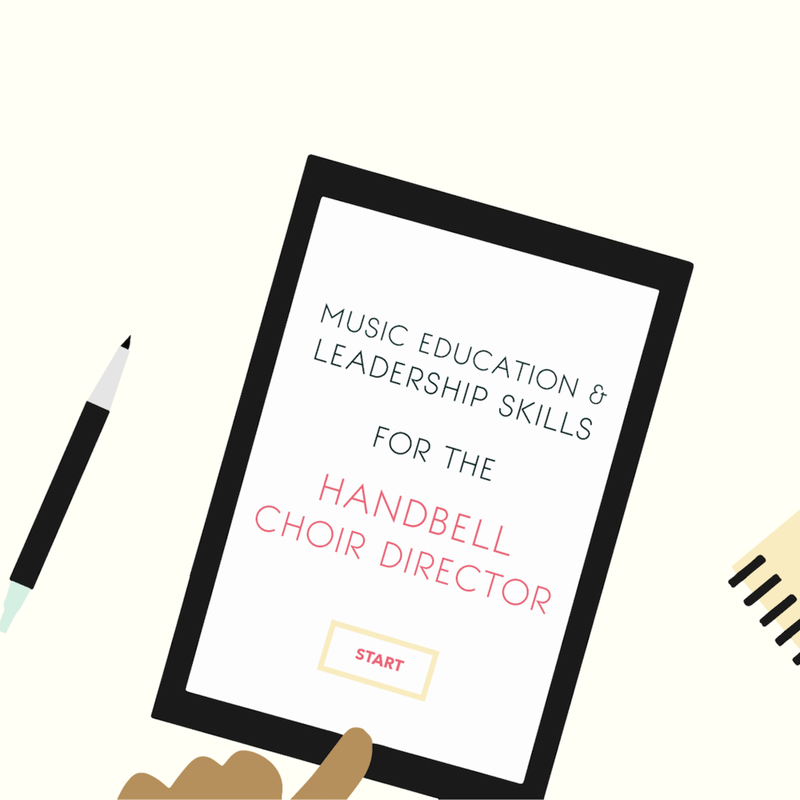 Join me in Music Education & Leadership Skills for the Handbell Choir Director - an online mini training course for handbell directors in church settings. Develop valuable teaching skills and gain the practical tools and experience you need to lead your handbell choir with creativity and confidence.